"At the time of impact, LADEE was traveling at a speed of 3,600 miles per hour [5,800 km/h] — about three times the speed of a high-powered rifle bullet," Rick Elphic, LADEE project scientist at NASA's Ames Research Center in California, said in a statement. "There's nothing gentle about impact at these speeds — it's just a question of whether LADEE made a localized craterlet on a hillside or scattered debris across a flat area. It will be interesting to see what kind of feature LADEE has created." NASA will use another probe still orbiting the moon to seek out LADEE's crash site and learn more about the impact. Scientists will use the space agency's Lunar Reconnaissance Orbiter to try to snap a picture of the LADEE impact site. The site itself is not viewable from Earth, and it is far from any area where previous moon landings occurred, NASA officials said. Before its impact, LADEE dropped down to altitudes below 1 mile (1.6 kilometers) above the surface of the moon, allowing researchers to collect unprecedented data, NASA officials said. The $280 million LADEE mission launched to space in September 2013 to investigate the moon's thin atmosphere and help scientists learn more about lunar dust. In particular, the spacecraft was designed to investigate a moon dust mystery that dates back to before the Apollo era. 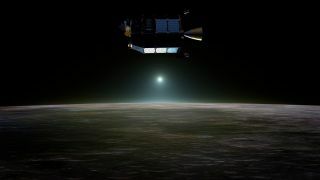 During the Apollo missions, some astronauts saw a glow on the horizon before sunrise as they orbited above the moon's surface. Earlier NASA probes also caught sight of that distinct glow. Scientists think that particles of dust lofted into the thin lunar atmosphere (called an exosphere) may have caused the glow; however, data collected by LADEE has not yet confirmed this theory. LADEE also helped scientists learn more about the moon's exosphere. Researchers think that exospheres are the most common type of atmosphere in the solar system, so learning more about the lunar atmosphere could tell researchers more about other bodies in the solar system, like Mercury. The small probe also survived the total lunar eclipse on April 14 to 15, making it through the low temperatures and battery drain it experienced when out of direct sunlight. "It's bittersweet knowing we have received the final transmission from the LADEE spacecraft after spending years building it in-house at Ames, and then being in constant contact as it circled the moon for the last several months," Butler Hine, LADEE project manager at Ames, said in a statement.